Equality Florida's Greater Gainesville Gala has been celebrating equality locally and statewide for 10 years! May 11, 2018 -- Gainesville, Fla. – Equality Florida, the largest civil rights organization working to secure full equality for Florida’s lesbian, gay, bisexual, transgender, and queer (LGBTQ) community, is celebrating 10 years of local and statewide achievements with hosting their annual Greater Gainesville Gala on May 19th. The organization will recognize Bob Karp with the Voice for Equality Award, Fred Pratt will receive the Lifetime Achievement Award and Sandra Carlisi and Elegant Events Catering will receive the Equality Means Business Award. The Voice for Equality Award recognizes an individual that has helped move the LGBTQ community closer to full equality, while the Lifetime Achievement Award recognizes a lifetime of support and activisim for the LGBTQ community and the Equality Means Business award shows appreciation of a local business for being inclusive to all. Equality Florida is honored to have the support of these individuals and organization and is excited to award each with a well-deserved award. Bob Karp has been called one of the pace setters of the LGBTQ rights movement in Florida. 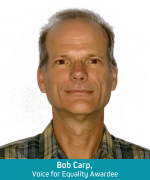 As the long-time leader of the Human Rights Council of North Florida, an organization dedicated to passing pro-LGBTQ policies in North Florida, Bob has helped to make Gainesville a beacon of progress for LGBT Floridians. This was recognized when he was chosen as the first recipient of Gainesville Pride’s “Man of the Year” award in 2000. Equality Florida has seen first-hand how Bob’s strategic leadership has helped change the landscape for LGBTQ people in Greater Gainesville. Over the years, the HRC of North Florida has played a leadership role in countless local campaigns to win safe school politics, non-discrimination protections, electing North Florida’s first openly gay Mayor Craig Lowe and in 2009 played a key role in defeating an extremist attempt to repeal Gainesville’s human rights ordinance. The work to change hearts and minds in Gainesville has had ripple effects across North Florida and across the South. Because of his tireless efforts Greater Gainesville is a safer, more inclusive place for all residents and their families. Sandra and her staff have created a restaurant and a catering business that has been described as “electric, inviting and a wonderful break to the routine”. She has proven to be a great ally who has created two very LGBTQ friendly community businesses for the greater Gainesville area. 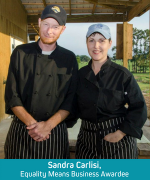 From having a toddler play area in the East End Eatery, to identifying public transportation routes around Gainesville, it is clear that Sandra has created a business that is inclusive and loving for folks from all walks of life in Gainesville. She has specifically made an effort to show the greater Gainesville LGBTQ community that she cares by sponsoring the catering and staffing the Equality Florida galas as well as catering many LGBTQ weddings and area events. Her inclusiveness was recognized by several local social justice groups including the Human Rights Council of North Central Florida, the Stonewall Democrats of Alachua County and the Pride Community Center of NCF. 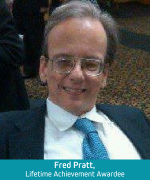 Fred Pratt has been a steady conscience of our community, fighting for justice and the rights of all. He has served on the boards of numerous community organizations, including Gainesville Area AIDS Project, Trinity MCC, Pride Community Center of North Central Florida, Stonewall Democrats, as well as the Democratic Disability Caucus. Fred has been actively involved in each as a reliable volunteer and member of the Board--the first to raise his hand to run a phone bank, fundraise, table, set up for an event, sell t-shirts, provide food, and anything else needed to make the organization successful. Whenever an issue important to Fred comes before the Gainesville City Commission, Alachua County Commission, School Board, or State Legislature he is right there to speak truth to power. His uncompromising efforts on the political battlefield have made him a talented fighter. Fred’s dedication to justice and human rights lifts the spirits of those privileged to know him, encouraging us all to work harder and do better.